From the Art Gallery to the China Gallery, up the Grand Staircase and into the Grand Vestibule... we made our way through all the the now-public areas of the Castle. Some highlights were the Waterloo Chamber, the Bed Chambers, Garter Throne Room, and St George's Hall (which will host the State dinner when the Inian Prime Minister visits). A few of us even saw staff members walking the corgies! We learned about the fire and the restoration project, which was completed in 1997 (just 5 years after the fire) in time to commemorate the Queen's 50th wedding anniversary. Just outside the main castle, we visited St. George's Chapel - where 10 British kings and 9 queens have been laid to rest. The choir room/area was especially beautiful. 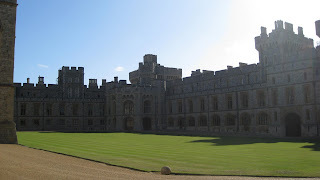 The town of Windsor was very quaint and we wished we had more time to stroll the streets.